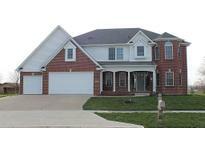 Below you can view all the homes for sale in the Chateaux At Woodfield subdivision located in Greenwood Indiana. Listings in Chateaux At Woodfield are updated daily from data we receive from the Indianapolis multiple listing service. To learn more about any of these homes or to receive custom notifications when a new property is listed for sale in Chateaux At Woodfield, give us a call at 317-493-0959. Seller invested over $40K last year but must sell it now. Don't wait to long! MLS#21629364. Flat Fee Realty, LLC. Center Grove schools, Community Pool, Playground, Trails, move-in ready! MLS#21631323. Steve Lew Real Estate, LLC. Well maintained w/ many nice touches. Close to everything. Come see! MLS#21623689. Keller Williams Indy Metro S.
Home Boasts 5 Beds, 3 Full Baths, 1 Half Bath Indoors & 1 Half Bath Outside For Pool - 2 Story Entry, Office w/ Hardwood Floors, Living/Dining room Combo, family room with Gas fireplace w/ Stairs Up To Kitchen/Breakfast room, Eat In Kitchen w/ stainless steel Appliances, Center Island, Granite Counters & 42" cabinets, Upstairs Includes Big Master w/ Tray/Crown Ceilings & H&H Walk In Closet, Master Bath w/ Seb Tub/Shower & Dual Sinks, Beds 2-5 On Upper Level, Basement Includes 9ft Ceilings w/ 2nd family Room, Exercise room, Storage room & Workshop - Outside/Backyard Paradise w/ Outdoor Kitchen, Covered Rear Porch, Hot Tub, & 40'x20' Pool w/ Diving Board On Deep End *Heated & Auto Pool Cover* MLS#21622197. Jeff Paxson Team. Beautiful Landscaping On Quiet Street Has Gorgeous View Of Stocked Lake That Includes Premium Sprinkler System & No Neighbors Behind. MLS#21610614. Jeff Paxson Team. Don't wait to check this home out! MLS#21591659. My Agent.